Nigeria is a middle-income, mixed economy and emerging market, with expanding manufacturing, financial, service, communications, technology and entertainment sectors. It is ranked as the 30th-largest economy in the world in terms of nominal GDP, and the 23rd-largest in terms of purchasing power parity. It is the largest economy in Africa; its re-emergent manufacturing sector became the largest on the continent in 2013, and it produces a large proportion of goods and services for the West African subcontinent. In addition, the debt-to-GDP ratio is 11 percent, which is 8 percent below the 2012 ratio. According to a Citigroup report published in February 2011, Nigeria will get the highest average GDP growth in the world between 2010 and 2050. Nigeria is one of two countries from Africa among 11 Global Growth Generators countries. For purchasing power parity comparisons, the US dollar is exchanged at 1 USD to 314.27 النايرة النيجيرية (as of 2017). 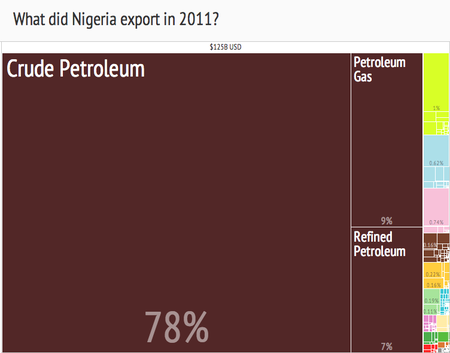 In 2005, Nigeria imported about US$26 billion of goods. In 2004 the leading sources of imports were China (9.4%), the United States (8.4%), the United Kingdom (7.8%), the Netherlands (5.9%), France (5.4%), Germany (4.8%), and Italy (4%). Principal imports were manufactured goods, machinery and transport equipment, chemicals, and food and live animals. 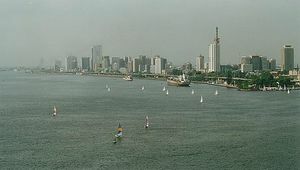 In 2005, Nigeria exported about US$52 billion of goods. In 2004, the leading destinations for exports were the United States (47.4%), Brazil (10.7%), and Spain (7.1%). In 2004 oil accounted for 95% of merchandise exports, and cocoa and rubber accounted for almost 60% of the remainder. الهند هي أكبر مشتري للنفط النيجيري، الذي يلبي 20% إلى 25% من احتياجات الهند المحلية للنفط. Indian oil companies are also involved in oil drilling operations in Nigeria and have plans to set up refineries there. ^ أ ب "Report for Selected Countries and Subjects". IMF.org. Retrieved 9 April 2017. ^ أ ب "Nigerian Gross Domestic Product Report Q2 2015". National Bureau of Statistics. Archived from the original on 15 September 2015. Retrieved 22 September 2015. ^ "Labour Productivity Report". National Bureau of Statistics. August 2015. Archived from the original on 2 October 2015. Retrieved 22 September 2015. ^ "Nigeria’s unemployment rate rises to 13. 9 % – NBS - Vanguard News". Vanguard News (in الإنجليزية). 2016-12-16. Retrieved 5 April 2017. ^ أ ب "CIA – The World Factbook". Cia.gov. Retrieved 26 June 2015. ^ أ ب ت ث "Foreign Trade Statistics". National Bureau of Statistics. 2015. Archived from the original on 15 September 2015. Retrieved 22 September 2015. ^ أ ب "Nigeria’s external debt to W’Bank, AfDB, others hit N1.63trn". Sun News. 24 February 2015. Archived from the original on 22 June 2015. Retrieved 22 June 2015. ^ "Nigeria's budget deficit now 1% after rebasing". News 24. 27 May 2014. Retrieved 22 June 2015. ^ أ ب Rogers, Simon; Sedghi, Ami (15 April 2011). "How Fitch, Moody's and S&P rate each country's credit rating". The Guardian. London. Retrieved 31 May 2011. ^ "Manufacturing Sector Report, 2015: Manufacturing in Africa" (PDF). KPMG. 2015. ^ "UPDATE 2-Nigeria surpasses South Africa as continent's biggest economy". Retrieved April 26, 2014. ^ "Subscribe to read". www.ft.com (in الإنجليزية). Retrieved 2017-06-02. ^ "Africa’s new Number One". Economist.com. Retrieved 9 April 2017. ^ "Your daily Naira exchange rate". www.abokifx.com. Retrieved 2017-08-23. ^ "Daily Parallel Market Exchange Rate". www.nairametrics.com. Retrieved 2017-08-23. ^ "XE: Convert USD/NGN. United States Dollar to Nigeria Naira". www.xe.com. Retrieved 2017-06-02. ^ "Nigeria’s Domestic, External Debts Now $44bn, Articles - THISDAY LIVE". Archived from the original on 13 June 2015. Retrieved 11 June 2015.